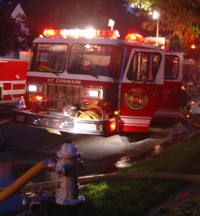 The Mount Ephraim Fire Department consists of all volunteer personnel, responding to over 400 calls per year, providing fire prevention/protection, rescue, and public relation services to the residents, businesses, and visitors of the one square mile borough including portions of Interstates 295, 76, and the Black Horse Pike. The department also provides mutual aide assistance to neighboring towns anytime, any place someone calls us. Regular business meetings are held on the third Thursday of every month at 8pm.